Paper, Yupo, Med. Weight, 20x26"
A 20x26" sheet of Yupo paper. This synthetic paper made of 100% polypropylene offers a unique alternative to traditional art papers. Waterproof and stain-resistant, it is exceptionally strong, durable and will not buckle or tear. It is acid-free, archival and has a smooth, bright white surface. Originally used for offset printing, it also accommodates silkscreen, embossing, pen & ink, drawing, acrylic painting and aqueous techniques. Yupo is machine-made in the USA and recyclable. As a watercolor paper, it has the advantage of being non-absorbent so colors lie on top of its surface producing brilliant, vibrant effects. Colors retain their true clarity and brilliance. Yupo requires no soaking, stretching, or taping flat. 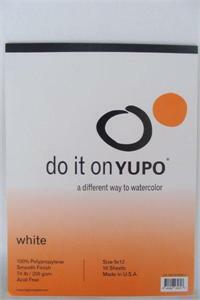 Best of all, it allows you to wipe off unwanted sections of your painting and start again with a fresh surface.